Anterior cruciate ligament (ACL) reconstruction hamstring method is a surgical procedure that replaces the injured ACL with a hamstring tendon. The anterior cruciate ligament prevents excessive forward movement of the lower leg bone (the tibia) in relation to the thigh bone (the femur) as well as limiting rotational movements of the knee. A tear of this ligament can make you feel as though your knee is unstable. Anterior cruciate ligament reconstruction is surgery to reconstruct the torn ligament of your knee with a tissue graft. 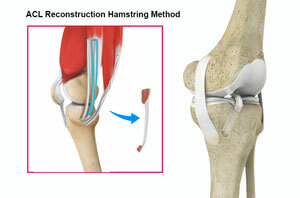 The goal of ACL reconstruction surgery is to restore knee stability. Anterior cruciate ligament reconstruction hamstring method is a surgical procedure to replace the torn ACL with part of the hamstring tendon taken from the patient’s leg. The Hamstring is the muscle located on the back of your thigh. The procedure is performed under general anaesthesia. Your surgeon will make two small cuts about 1/4 inch long around your knee. An arthroscope, a tube with a small video camera on the end is inserted through one incision to see the inside of the knee joint. 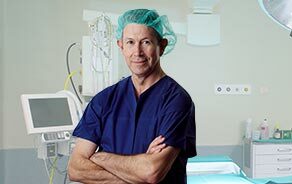 Along with the arthroscope, a sterile solution is pumped into the joint to expand it enabling the surgeon to have a clear view and space to work inside the joint. The knee is bent at right angles and the hamstring tendons felt. A small incision is made over the hamstring tendon attachment to the tibia and one or two tendons are stripped off the muscle and the graft is prepared. The torn ACL will be removed and the pathway for the new ACL is prepared. The arthroscope is reinserted into the knee joint through one of the small incisions. Small holes are drilled into the upper and lower leg bones where these bones come together at the knee joint. The holes form tunnels in your bone to accept the new graft. Then the graft is pulled through the predrilled holes in the tibia and femur. The new tendon is then fixed into the bone with screws to hold it into place while the ligament heals into the bone. The incisions are then closed with sutures and a dressing is placed. Following the surgery, rehabilitation begins immediately. A physiotherapist will teach you specific exercises to be performed to strengthen your leg and restore knee movement. Avoid competitive sports for up to 12 months to allow the new graft to incorporate into the knee joint. Anterior cruciate ligament reconstruction is a very common and successful procedure. It is usually indicated in patients wishing to return to an active lifestyle especially those wishing to play sports involving running and twisting.